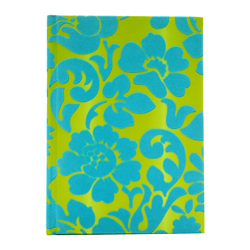 Beautifully designed hardbound journal features gorgeous floral design flocked cover in aqua and lime. By designer Tricia Guild of Designers Guild/UK. CLOSEOUT...only 4 left! SIZE DIMENSIONS: ~6" x 9"